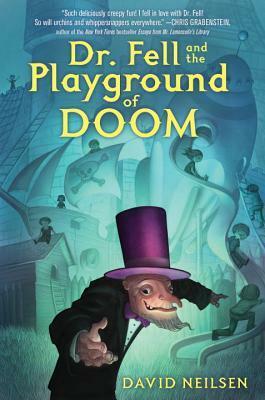 When the mysterious Dr. Fell moves into the abandoned house that had once been the neighborhood kids’ hangout, he immediately builds a playground to win them over. But as the ever-changing play space becomes bigger and more elaborate, the children and their parents fall deeper under the doctor’s spell.Only Jerry, Nancy, and Gail are immune to the lure of his extravagant wonderland. And they alone notice that when the injuries begin to pile up on the jungle gym, somehow Dr. Fell is able to heal each one with miraculous speed. Now the three children must find a way to uncover the doctor’s secret power without being captivated by his trickery. I have not read much middle grade but I am trying to really change that. I want broaden my scope of books I read and I decided to take a chance with Dr. Fell. The cover looked dark, creepy, and it was the idea of a haunted playground that sold me. We follow three friends, Jerry, Nancy, and Gail, as they embark on an adventure to solve the curse behind Dr. Fell, a mysterious old man and his playground. They must work together and find trust in someone unexpected to save the town from an evil hiding inside a house. This story was really different for me. I was not expecting some things to happen, especially since it is geared towards middle grade readers, but I think that is what hooked me in more. There was a dark humor to the story and from the first chapter the hairs are standing on your neck in anticipation of what is to happen. Can I just point out that there was an attempted exorcism here in this book. A exorcism...in a book for middle grade readers. How amazing is that. I never got that in books when I was growing up so I want to give props to the author for doing that. However, when you do read it, it will come off more comical than scary. I am curious to see what happened to the dark and mysterious Dr. Fell, would be kind of cool for a follow up story but I am totally going to keep my eyes open for more middle grade books. David Nielsen did a marvelous job in grabbing my attention and if you give this book a shot, I am sure he will for you too!